I sure don’t know all the answers or even very many of them – but I do know God is good. And just as a loving parent wants the best for theirs – He does so much more. We are body, soul and spirit. The most important factor in divine health is a healthy soul and spirit – by the looks of things you’ve got that department covered – so you’re more than three-quarters healed! These old tents are growing older the moment we’re born – we keep praying they’ll house our souls well ‘til we hear Him say, well done. Oh and you can count me in to believe with you beyond the shadow of a doubt for your healing. Oh, my! Doug, thank you so much. Thank you for taking time to read and comment. And thank you for your agreement for my healing. This tent is really getting older! LOL You are a precious man of God. Blessings to you! One of the biggest questions in life Lynn… why some, why not? All I know is that God is a healer, it is in His character to heal. Jesus represented His Father’s character while He was on earth. So, keep hoping, keep asking, keep proclaiming; you are simply reminding Him of who He is! Last week after having an exam, I received a call from my doctor to come in to discuss abnormalities from the X-rays taken. For some reason, I couldn’t get beyond the word abnormal. I don’t believe I was afraid, but I did want to peek behind the curtain. Like you, I’m putting my trust in the Lord. I have not seen what lies ahead but I’m not worried; I will continue to run my race. Regardless of our geography, I would run with you any day. I extend my hand toward you, affirming my agreement for your healing. As a three time cancer survivor and one who currently has a miracle of speech without the anatomy, I can say I am healed but not in the manner I would have desired or expected – a miracle that amazes the medical community. We forget we live in a fallen world, this is not our final destination. Healing is part of the kingdom – we may not be physically healed until we live there fully which is still future. I’ve often wondered why some are healed and others are not. Especially when some seem so much more “deserving” than others. Which reveals to me my arrogance, because only God knows what his reasons are. My finite mind cannot begin to fathom his plans. I agree with this, after I quit wondering forever. I did start getting better physically?? Keep on doing your best, and I know you do. Ah … one of the age-old mysteries/questions of life. It used to drive me almost crazy … I thought I needed an answer, with time I’ve learned to live in the tension of that unanswered question. He uses it all — the good, the bad, the wounded, the healthy, the illness, the disease, the hurt, the pain. We often miss it, but just because we miss it or don’t understand it doesn’t mean that he doesn’t, either. Wow Lynn! Simply encouraging thoughts illustrated by beautiful writing! Your strength and faith inspire me! The tough part is continuing to trust God when healing doesn’t take place. God has chosen to heal me several times in 60 years. He keeps patching this “tent” that was so frail from the beginning: polio, migraine headaches, post-polio syndrome (three times) and fybro. Now post-polio syndrome is back and He has chosen to leave it. As my Creator, I recognize His authority to make me according to His purposes. As Job said, “Though He slay, I will serve Him.” Like the apostle Paul, I rejoice in being poured out in service to Him. When He heals me, the gift is amazining. When He doesn’t heal me, He is even more amazing. With this post I am reminded that on this Earth, we see as through a mirror darkly. We don’t see the whole picture on this Earth. The Weaver is weaving a great masterpiece, and we only see the tangled threads on the backside. One day, we’ll see the whole glorious tapestry. A difficult question that always leads us to chose whether or not we will rest in and trust the sovereignty of God. He is always good – even when we don’t understand. Praying with you for complete healing! He is able! Awesome thought, Marja! I do and will continue! Bless you! Love you! Oh, my MTJ, what a precious thought! To have a special new friend running (well, let’s walk, ok? LOL) with me. That is really touching. I’ll be praying for you. May the Lord bless you with good results. Be blessed! Michael, I so pray the Lord heals you. I pray His best for you! Such a dear friend. Thank you! Blessings to you! Thanks so much, Steph! I appreciate your taking time to read my post and comment. Blessings to you! This is great insight into John 5. I have never looked at it this way. But you are absolutely right. I have always believed God has a purpose and plan, whether we understand it or not. Like you and many others, my wife also wonders about God’s decisions in regards to healing. She has a condition that creates extreme pain in her face. She calls this the beast. But it’s a pain that many who have this condition have considered suicide. We’ve often prayed that God would relieve her and heal her of this pain. She has good days and some not so good. But most of all, she has hope. Our hope lies in an all-knowing and loving Savior. It’s always a blessing to see how other believers handle an illness, sickness, or condition. Many have such courage and strength. But for me, though I give them credit, I give God the glory. For we can do nothing apart from Christ. Great post Lynn. Thank you! Janet, I love the way you put that…learned to live in the tension. I totally understand. And whatever your tension, I pray for you. Be blessed! Thank you so much, Glynn! I always appreciate your visits! Bless you! Hey, Alisa! Wow! Thank you so much! So happy to see you! Your kind words truly bless me! Blessings to you! Kevin, you are so right! Trusting is sometimes hard, isn’t it? But we are defeated without it. Thanks so much for visiting and commenting. Bless you! Wow! Linda, I didn’t know you had been through all that. Bless your heart. Praying for you! So true, Patti. So true! The thought just struck me. I use eyedrops in the morning that cause a short-lived blurriness and it is difficult to see. Sometimes I try to hard to focus…not just physically but spiritually, too! Thank you! Stephanie, you’re so right. God is good…all the time. Even if we do not understand His ways. Doesn’t change His grace and mercy. Thank you. You bless me! Anne…thank you so much! So nice to have you visit. Bless you! Lynn, this is fantastic. We only need to trust God and in HIS own time will his healing come. I’m proof of it! Praise God! Thank You Father God for this lesson and reminder of Your grace and mercy. Lynn, Thank you for your inspirational words. Indeed, we must trust in our Heavenly Father; He knows what’s best for us. 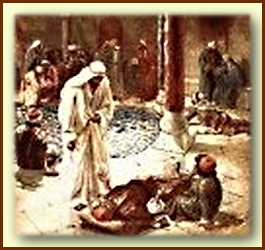 The Bethesda Pool is among the most difficult healing examples in the gospels. Because of the way my brain processes, it’s always a “EH?” one. Beautifully written and so true, Lynn. I’m so happy when you’re part of the carnival.